You need to have in place workplace compliant first aid kits and equipment and these first aid kits need to be checked on a regular basis, as all products need to be in date. 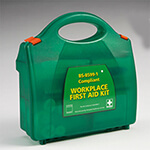 www.first-aid-equipment.co.uk will help you stay compliant with your requirements, as they offer a range of first aid kits and equipment that are suitable for the workplace, from large workshops to small offices. Ordering is easy through their shop and delivery is direct to you.